The Zhong Yang Kuo Shu Guan was established in 1928. My teacher, Wang Chueh Jen, was in the professor-research class, the 1st annual class. He trained to be a teacher, but since this was the first class, they also helped design the programs later used for all successive classes. He brought Tien Shan Pai to the East Coast [of China]. Later, he brought Tien Shan Pai to Taiwan. 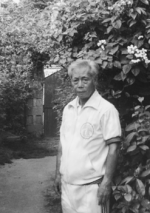 He trained special agents for the Republic of China during the war. He had to leave when the communists took over, because he worked for the old government. When he worked for the government, he taught a lot of fighting skills to these agents. He taught over one hundred agents for the government. 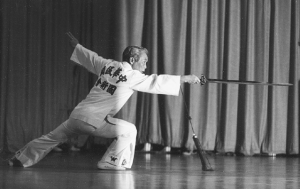 From this he developed the radar style of fighting (雷達). He put his martial arts experience together to train the armed forces. He was too short to be in the army, but he had so much skill in martial arts. So he was hired to teach martial arts. He was established first in China and then he moved to Taiwan. This was the old way. So many masters in China worked very hard, but only a few were very successful. 1981 marked the first year that then-Grandmaster Wang visited the United States. Wang stayed in the U.S. for six months, visiting Cincinatti, Maryland and the Washington, D.C. area. During this time Wang instructed both Huang and Huang’s students. Wang returned to the U.S. in the fall of 1982 and stayed 4 months until spring 1983. He visited a third time in the fall of 1985 until the spring of 1986. In 1985-1986, Wang returned to the U.S. for his second to last visit to the U.S. At that time, he asked Huang to bring some wood and paint. Wang produced seven panels of calligraphy, which form an archway announcing a “Wu Kui Tang” (武魁堂). During the visit, Wang told Huang that Huang was his only formal disciple; although Wang had some other disciples, they did not go through the entire ceremony. At first, Huang did not understand his teacher’s explanation. Later, Huang learned that as the only formal disciple he was the lineage disciple and would inherit the title of 64th generation Grandmaster of Tien Shan Pai (天山派). Huang’s birth name was Wee Hoo Huang (黃偉鶴). When Wang inducted Huang as a disciple, Wang gave his student a disciple name: “Chien-Liang” (乾量). This name, crafted by Wang, has a profound meaning when translated. “Huang” was his given last name. It is, however, the same name as the famous “Yellow” emperor of China. A “Liang” is a vessel used as a standard unit of measurement in China, in the same manner that a liter or gallon is a standard measure in the West. “Chien” translated as “great” or “big.” The three words together–Huang Chien-Liang–formed a great compliment: a person of great capacity.In the spring of 1986, Huang called his Shi Ye (師爺) and asked him if he should change his name to his disciple name. Wang was very happy, because this name change signaled Huang’s commitment to dedicate his life to teaching and promoting the Tien Shan Pai (天山派) style of Chinese martial arts.